Max is the protagonist of the children's picture book "Where the Wild Things Are" by Maurice Sendak. The book is about the imaginary adventures of Max, a young boy who is punished for "making mischief" by being sent to his room without supper. Max wears a distinctive wolf suit during his adventures and encounters various mythical creatures, the wild things. Although just ten sentences long, the book is generally regarded as a classic of American illustrated children's literature. Written in 1963, it was awarded the Caldecott Medal in 1964. Download the free PDF file here and make your own Max toy! watch out for the 'wild things' to go with max soon! Okay, that one is really good! 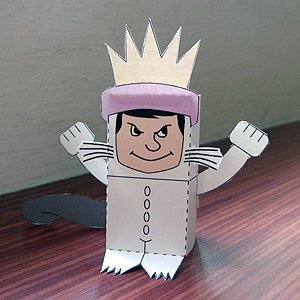 I can't wait to play with him in my Where the Wild Things Are shoebox diorama!